I hope all of you babes had a wonderful weekend! This week will be my first full week back to work and I’m not going to lie…I wish the weekend could just last a littleeee longer! The first official day of fall is just a few short weeks away, but the weather here has remained in the upper 80’s. While I am getting excited to pull out my favorite boots and scarves, you won’t find me complaining about the heat…I am a summer girl through and through! This weekend I wore this easy breezy outfit for a dinner date with the husband. 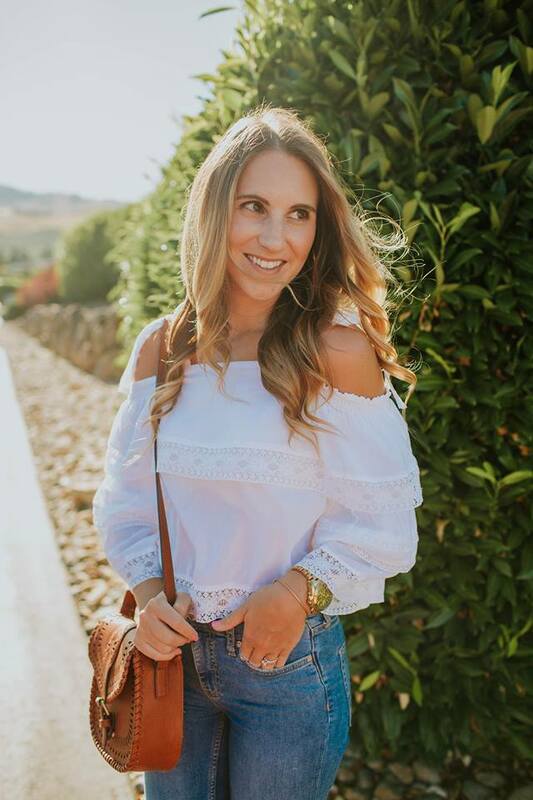 It was the perfect casual date night look, especially in the sweltering 90 degree evening! 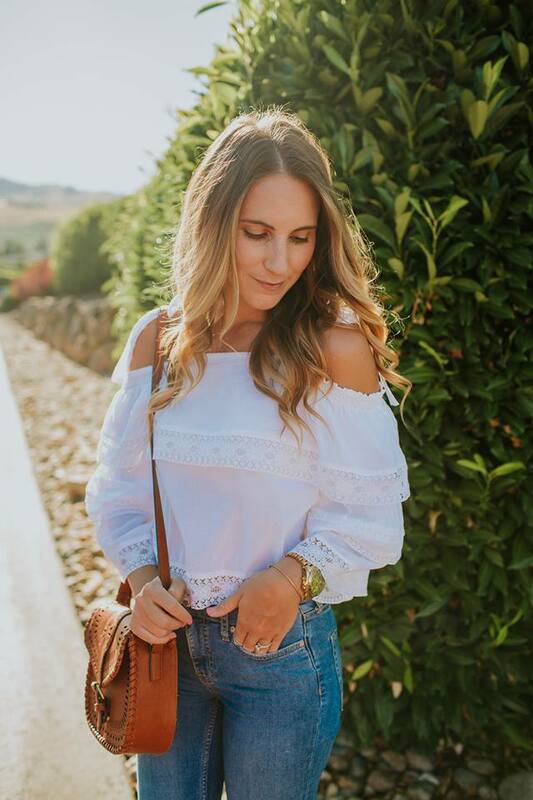 Taking a There’s nothing I love more in the summertime than a white top and denim. Pairing a pretty white top with my best denim ensures that I feel like a million bucks. There is no easier summer combo! 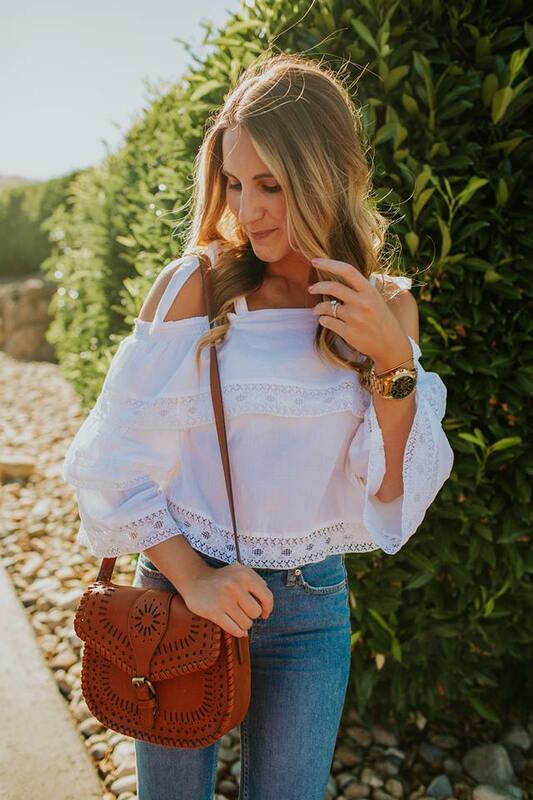 Throw on a pair of espadrilles and grab your favorite cross body bag and you’ve got an easy, effortless summer look. Want to add a fun summer touch? Add a pair of tassel earrings to add a pop of color. 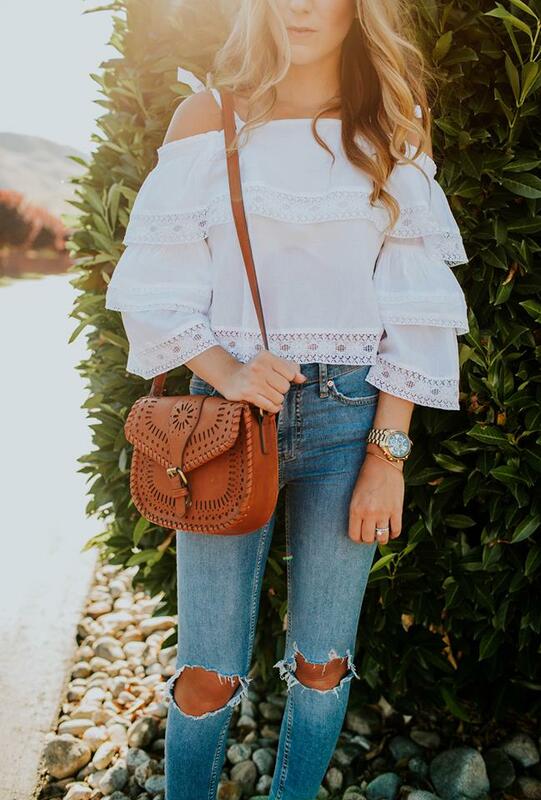 The moment I saw this off the shoulder top, I was sold. Hello…ruffles!! It’s a fun summer piece that can easily be paired with shorts, a skirt or jeans! Is there any print more perfect for summer than a palm print? I’ve been palm obsessed for awhile now, so the second I saw this sweet palm top from The Purple Door Boutique, I was sold. This flirty little number is made with the breeziest fabric making it perfect for the summertime heat! It’s the prettiest combo of pale pink and green, which I love (because of the sun it’s coming off more white!). I’ve worn this cutie with white denim shorts (as seen here!) and distressed denim, but plan on wearing it this weekend with a white skirt. If you are as palm print obsessed as I am, you will want to check out this gorgeous maxi (in the same print as my top!) and this fun little dress. I want to pack both for a vacation to the beach ASAP! In other exciting news, the Nordstrom Anniversary Sale starts TOMORROW for cardholders! If you haven’t seen my NSALE rundown, check it out here for all of the details! Tune in tomorrow morning as I share my sale impressions and top picks!